Meredith Whitley, Ph.D., examines myths and minefields facing young athletes in underserved communities. Despite a turn in collegiate athletics, these days Meredith Whitley, Ph.D., prefers to leave the field to her subjects and students. But when the topic turns to academic research, Dr. Whitley, assistant professor of Exercise Science, Health Studies, Physical Education and Sport Management, is positively prolific. Since 2013 alone, Dr. Whitley has coauthored a book, received six research grants and found her name atop 20 articles on a variety of issues—from physical activity as the foundation of life skills learning to the benefits of community-based sports programs for girls in Northern Uganda. Not surprisingly, a passion for understanding the correlations and causalities affecting young athletes in risk-laden environments—and developing viable solutions—informs Dr. Whitley’s ongoing research efforts. In researching “Greatness (un)channeled,” Dr. Whitley and her co-authors learned that it truly takes a village to raise an elite athlete out of the kind of underresourced, violent urban conditions that pose an enormous risk to physical, mental and emotional development. In preparing “The role of sport for youth amidst trauma and chaos,” she and her cohort uncovered stark shades of gray in the dominant but myopic narrative of sports as a positive influence on at-risk children. Both articles appeared last year in the international journal Qualitative Research in Sport, Exercise and Health, the latter in a special issue—Sport in Under-Resourced, Underdeveloped, and Conflict Regions—which was lead-edited by Dr. Whitley and is about to become book number two on her shelf of accomplishments. Odds are it won’t be the last. Because, despite all, Meredith Whitley has barely gotten off the blocks. 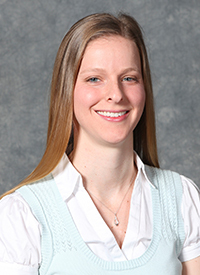 Meredith Whitley, Ph.D., is an assistant professor in the Ruth S. Ammon School of Education, coordinator of the School’s Sport-Based Youth Development specialization and a former college basketball player. She has forged partnerships between Adelphi and community organizations around the world, addressing health and wellness concerns from Jamaica to Uganda. She has also created similar opportunities for Adelphi students to work with local nonprofits in Queens, New York, as well as in Massachusetts and Michigan.